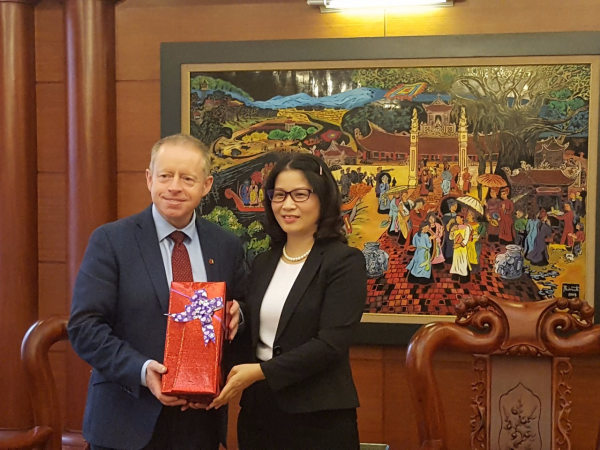 In the afternoon of November 13, 2018, at the Head office of the Ministry of Agriculture and Rural Development, Mr. Ciaran Cannon – Ireland’s Minister of State for the Diaspora and International Development awarded the Grant Agreement for the Vietnam Ireland Bilateral Education Exchange (VIBE) project funded by the Irish Embassy to the President of Vietnam National University of Agriculture (VNUA) – Prof. Nguyen Thi Lan. Attending the ceremony were also Mrs. Cait Moran - Ireland's ambassador to Vietnam, Mr. Le Quoc Doanh - Deputy Minister of Agriculture and Rural Development, Mr. Chu Van Chuong - Deputy Director of International Cooperation Department, representatives of VNUA’s Office of International Cooperation, and Dr. Bui Le Vinh - Lecturer at the Faculty of Land Management - project leader. 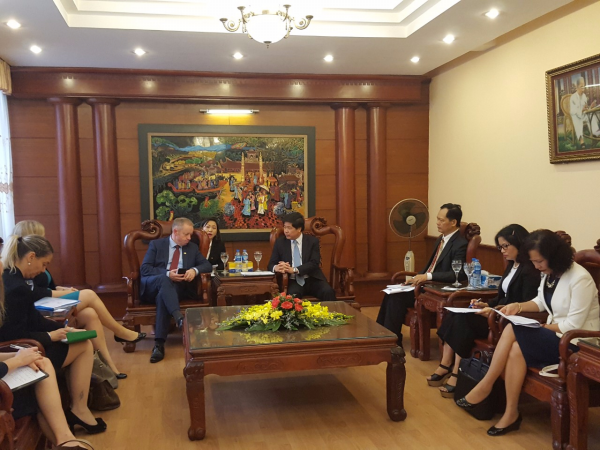 The Vietnam Ireland Bilateral Education Exchange (VIBE) funded by the Irish Embassy is part of the Irish program for Development Experience Sharing, which aims to support bilateral cooperation in education and research among universities and research institutions of Vietnam and Ireland. 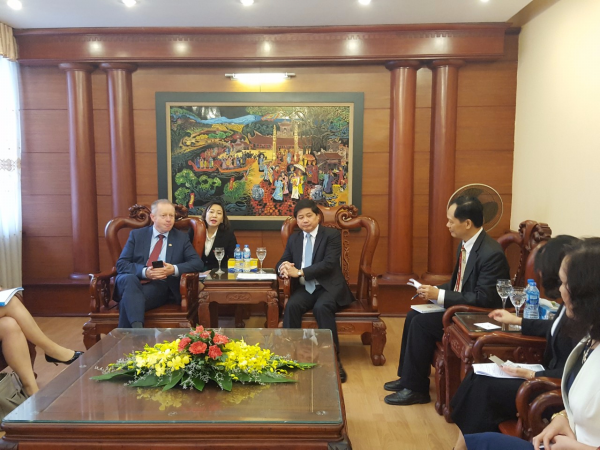 Being one of the key universities in Vietnam and of the Ministry of Agriculture and Rural Development in the field of agriculture, VNUA has also been focusing on establishing collaborative relationships with leading universities in Ireland. In 2015, Vietnam National University of Agriculture was one of the five universities in Vietnam receiving grants from the Irish Aid and the Irish Embassy for the implementation of the first phase of VIBE project on “Developing a training program in Food Technology and Business” in collaboration with the University College Cork (UCC). After two years of the project (from January 2016 to December 2017), VNUA successfully launched a new training program in Food Technology and Business with 145 freshmen for the 2018-2019 school year, which was far higher than the project’s expected one with only about 60 students for the first year. After project completion, VNUA’s Office of International Cooperation kept connecting different faculties and offices at VNUA with other partners in Ireland to develop cooperation programs. As a result, in 2018, Vietnam National University of Agriculture continues to be awarded with a 140,000 Euro grant from the Irish Embassy for the project on “Galway - Vietnam National University of Agriculture (VNUA) - Vietnam Ireland Bilateral Education Exchange (VIBE) Programme on Climate Resilient Agriculture & Environmentally Sustainable Landscapes” in collaboration with the National University of Ireland, Galway, for a two-year period from January 1, 2019 to December 31, 2020. The objective of the project is to enhance research and training capabilities for VNUA’s staff and students via different visits and study tours in Ireland for 1-3 months. In addition, the project will also focus on piloting Climate Smart Agriculture model in Thuan Thien agricultural village (CSV) into the implementation plan in Yen Bai province for the new rural development period from 2021-2025. Sharing at the ceremony, the Minister of State, Mr. Ciaran Cannon, highly appreciated positive collaboration results and activities that have been carrying out between Vietnam and Ireland in general as well as between Vietnam National University of Agriculture and the National University of Ireland, Galway in particular. Ireland government considers Vietnam a priority partner in its development cooperation policy, especially in Ireland's National Strategy for Development Cooperation with Vietnam for the period 2017-2020, Ireland continues to support Vietnam in poverty reduction, responding to climate change and the implementation of Sustainable Development Goals set by the United Nations. Sharing opinions with the Deputy Minister, Le Quoc Doanh, and VNUA’s President, Prof. Nguyen Thi Lan, the Minister of State - Mr. Ciaran Cannon said that Ireland will consider education and training as a key cooperation field in the coming time and encourage higher education institutions of the two countries to develop mutual collaborations. 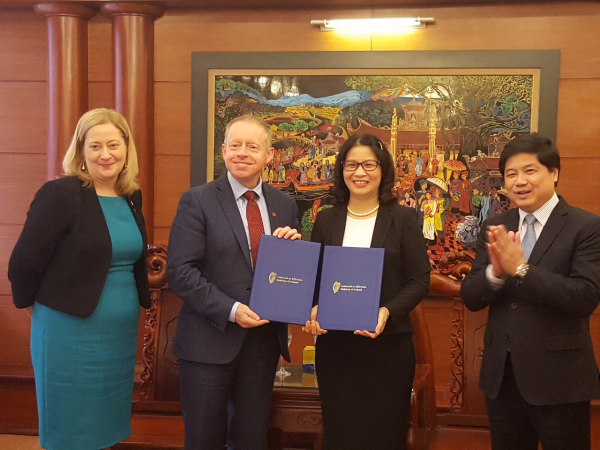 The Irish government will continue to fund research projects, lecturer exchanges and 30 scholarships for Vietnamese students to study in Ireland each year.